The Australian company Sunbird Energy (Sunbird) and its local partner, the national oil company (NOC) PetroSA, are considering to use a floating production, storage and offloading (FPSO) vessel to develop the Ibhubesi gas field offshore the west coast of South Africa. Discovered in 1981 by Forest Oil Corporation (Forest Oil) and Anschutz Corporation (Anschutz), the Ibhubesi gas field belongs to the Production Right Block 2A covering 5,000 square kilometers in the Orange Basin approximately 100 kilometers offshore the Northern Cape Province. Since 1981, two exploratory drilling campaigns were led, revealing all the potential of the wet gas field of Ibhubesi to become the largest gas field in South Africa. 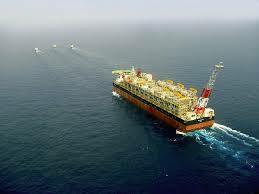 – 4.3 million barrels of recoverable condensate. In addition the Block 2A is suspected of significant resources upside with more than 5 trillion cubic feet (tcf) unrisked gross prospective resources with a nearly certain probability of P90. This resources upside will be subject to intensive exploration campaign that may take a couple of years more for conclusions. In this context, Sunbird and PetroSA are considering to develop Ibhubesi gas field in phases. Since South Africa is short of natural gas, any contribution of the Ibhubesi gas field development would meet sustainable demand on the local market. For this Ibhubesi Phase-1 project, Sunbird selected the tandem JP Kenny from The Wood Group and Granherne from KBR to perform the pre-front end engineering and design (pre-FEED). While JP Kenny is working on the subsea system, Granherne is designing the FPSO. Since Sunbird took over Forest Oil and Anschutz interests in the Block 2A, it favored the FPSO concept in order to monetize immediately Ibhubesi valuable condensate reserves. Therefore, the condensate should be treated on the FPSO to be offloaded on tankers, while the natural gas should be piped out to shore. 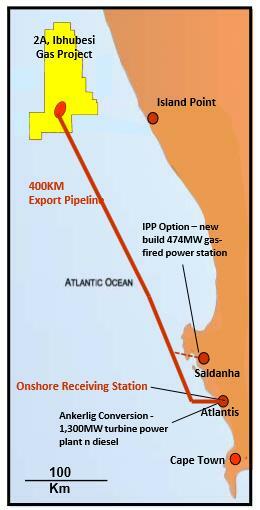 Although the Ibhubesi gas field is located only 100 kilometer from the shore, JP Kenny and KBR are considering a 400 kilometer subsea export pipeline up to potential power plants in the Northern Cape Province. In that respect, Sunbird and its partner PetroSA have two options with the existing diesel-fired Ankerlig power plant or with the projected Saldanha 474 MW gas-fired power plant. For this Ibhubesi Phase-1 project, Sunbird and PetroSA are planning to invest $1.4 billion capital expenditure. Then for Ibhubesi Phase-2, Sunbird and its partner should invest $400 million more to add new production wells. From the current planning, Sunbird and PetroSA expect JP Kenny and Granherne to complete their pre-FEED and FEED work in 2014 in order to commence the engineering, procurement and construction (EPC) of the Ibhubesi FPSO in 2015 for first production in 2017.